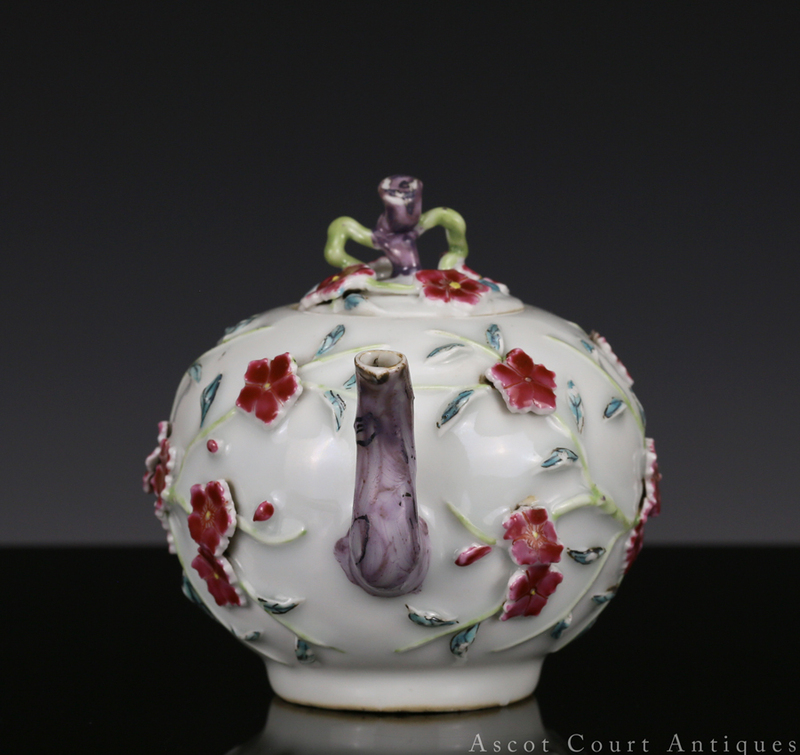 A very fine 18th c Yongzheng famille rose teapot, of rounded peach shape with its puce colored stem, handle, and spout rendered with bark texture to imitate the look of tree branch. The body is appliqué-decorated with sculpted/molded peach blossoms in raised high relief. 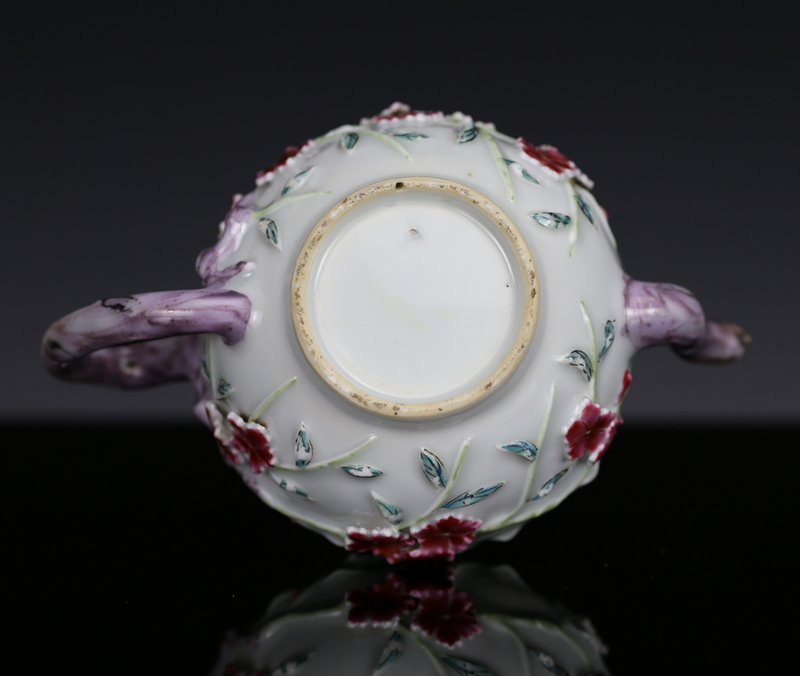 Although this piece was likely made for export to Europe, its form is grounded in older Chinese traditions and shapes. 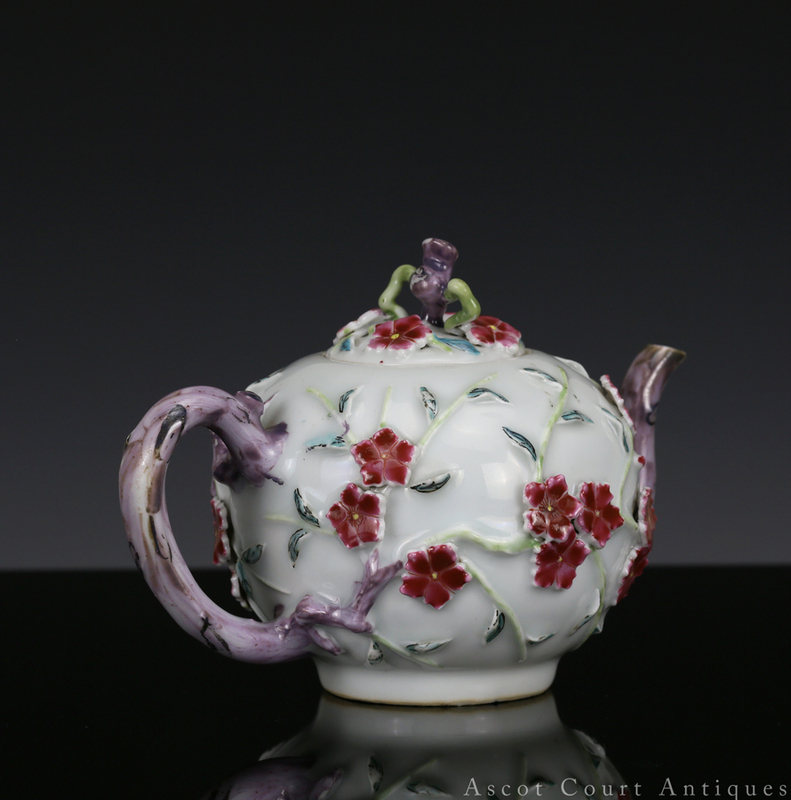 The teapot, based on older wine ewers, emerged during the late Yuan and became popular during the Ming. 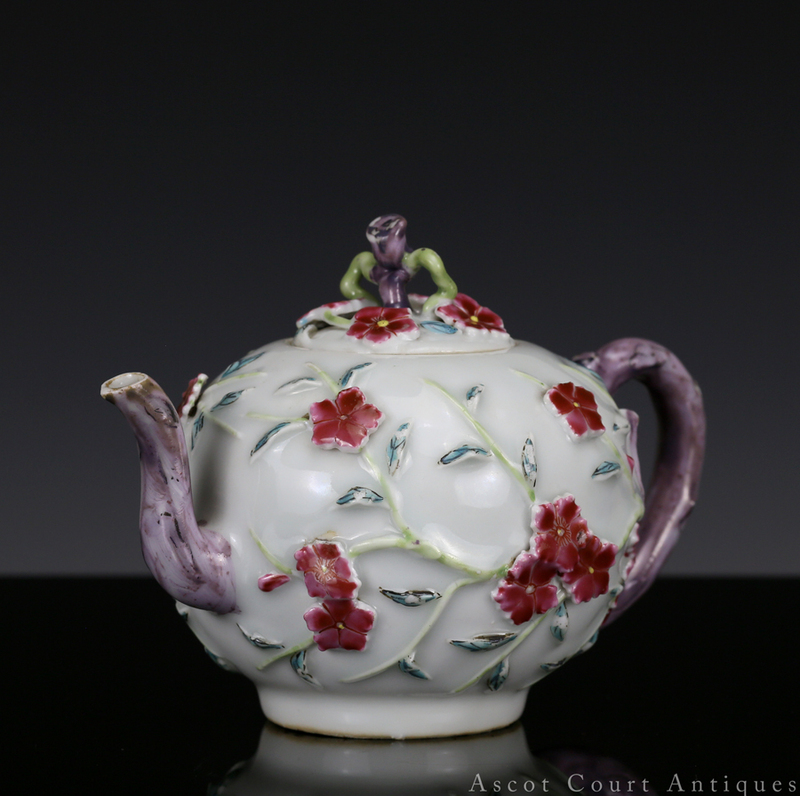 Complicated teapot designs began appearing during the late 16th century, as private kilns at Jingdezhen experimented with 3-D designs that involved complex shapes, latticework, mold or sculptured elements, and appliqué decorations. 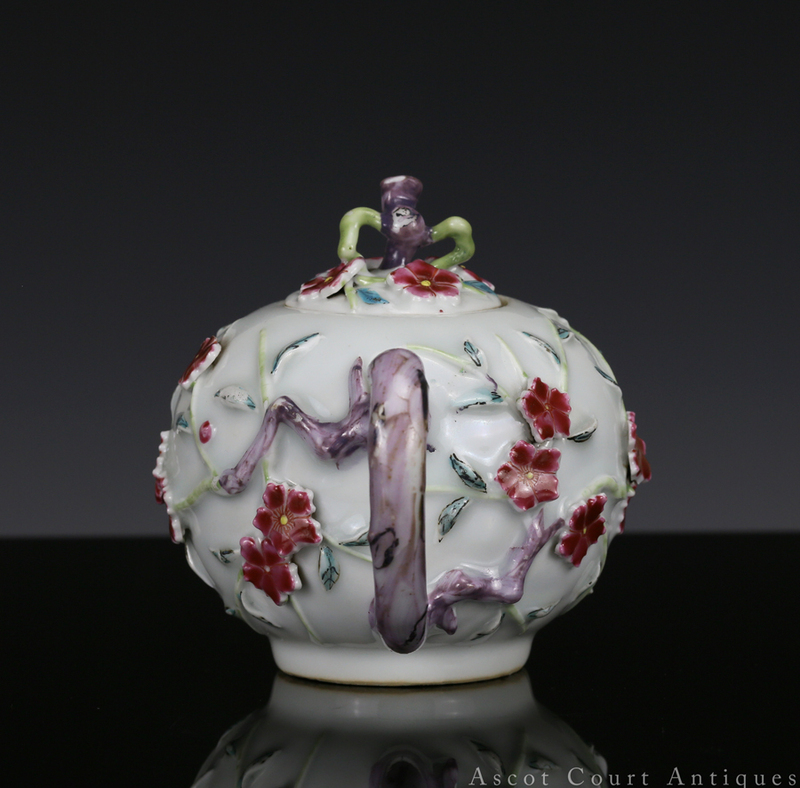 Chinese teapots of the 16th – 18th century often mirror organic natural forms such as fruits (e.g. pomegranates and peaches) and plants (e.g. bamboo and lotus). 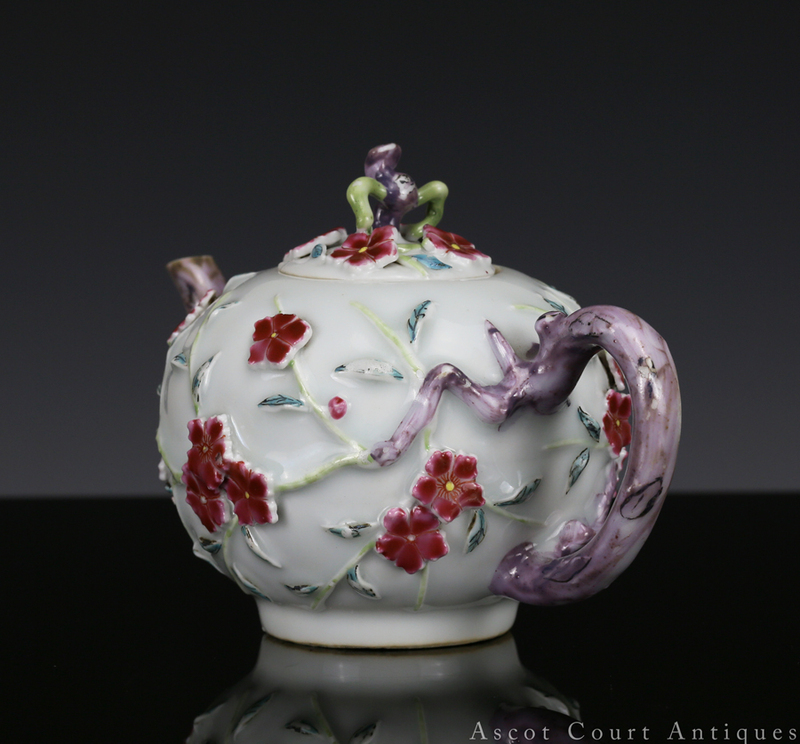 Most of these fruit or plant form teapots were made for the non-official domestic and trade markets; the playfulness and whimsy of these pieces meant that they were unsuitable for the dignity of the imperial court. However, a few imperial teapots of naturalistic form were produced during the late Kangxi period (see figures 1 & 2). These vessels were much finer in quality, and emit an air of refinement and restraint. 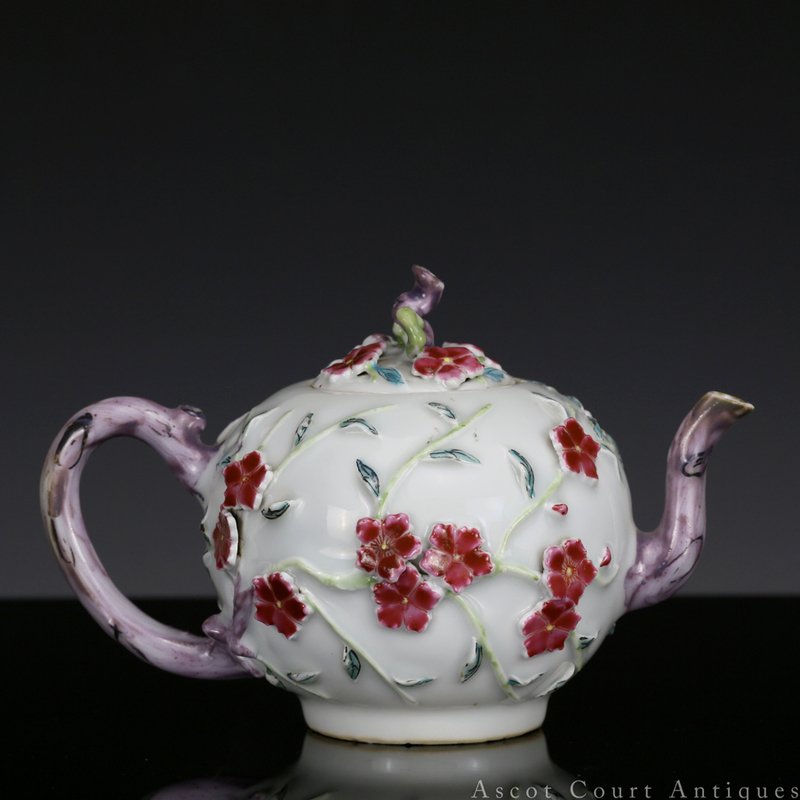 This particular Yongzheng teapot was much influenced by the aforementioned design elements from Kangxi imperial wares. 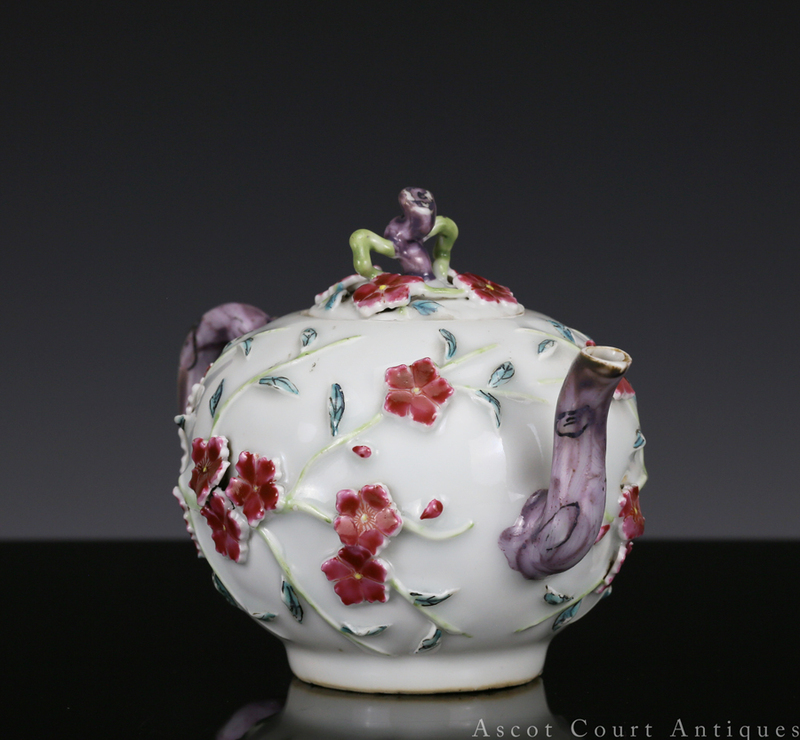 Unlike earlier fruit-form teapots from the late Ming and Kangxi periods, it is less garish and less expansive. In form it is well-proportioned and balanced, tempering gorgeousness with high elegance. This kind of reserved whimsy was likely unappreciated by European consumers. 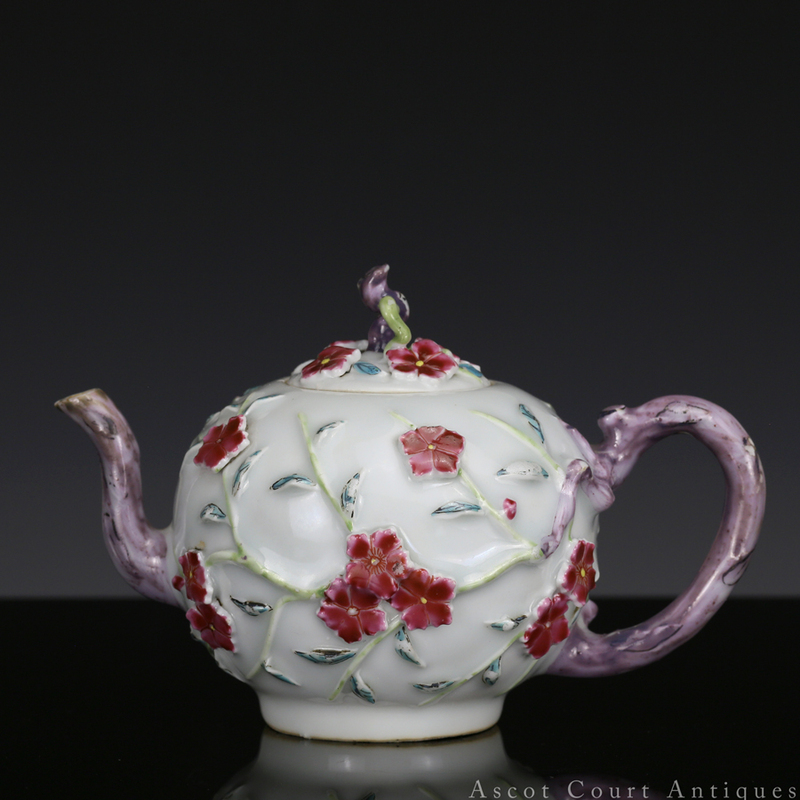 As the 18th century progressed, export famille rose teapots became increasingly exaggerated in design, often appearing over-decorated to the point of ostentation. But as Europe was burning with rococo fever, florid surfaces were all the rage. 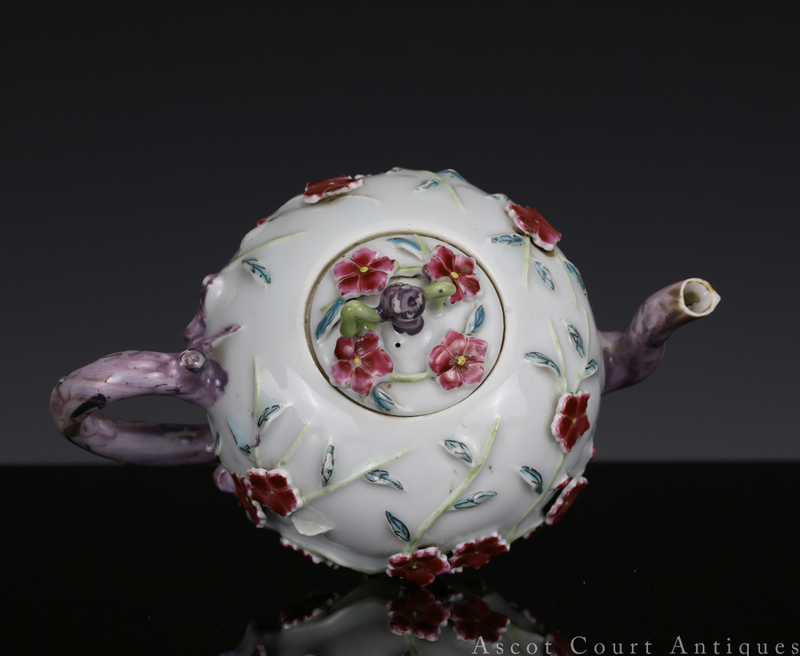 In 1735, the German Meissen factory produced its own version of the appliqué-decorated teapot, as Johann Joachim Kändler designed a covered bouillon cup encrusted with roses for Princess Wilhelmina of Prussia. This type of polychrome porcelain is so popular with the west that Meissen still produces pieces in this style today.